The uterine cycle describes a series of changes that occur to the lining of the uterus, or endometrium, during a typical menstrual cycle. The uterine cycle includes the increase in the endometrium in preparation for implantation and the shedding of the lining following lack of implantation, termed menstruation. Menstrual cycles are counted from the first day of menstrual bleeding. Endometrial thickening is stimulated by the increasing amount of estrogen in the follicular phase. If implantation does not occur, progesterone and estrogen levels drop, which stimulates menstruation. endometrium: The mucous membrane that lines the uterus in mammals, in which fertilized eggs are implanted. menstrual cycle: In the females of some animal species, the recurring cycle of physiological changes associated with reproductive fertility. decidua: A mucous membrane that lines the uterus: it is shed during menstruation and modified during pregnancy. Several changes to the uterine lining (endometrium) occur during the menstrual cycle, also called the uterine cycle. The endometrium is the innermost glandular layer of the uterus. During the menstrual cycle, the endometrium grows to a thick, blood vessel-rich tissue lining, representing an optimal environment for the implantation of a blastocyst upon its arrival in the uterus. Menstrual cycles are counted from the first day of menstrual bleeding and are typically 28 days long. During menstruation, the body begins to prepare for ovulation again. The levels of estrogen gradually rise, signalling the start of the follicular, or proliferation, phase of the menstrual cycle. The discharge of blood slows and then stops in response to rising hormone levels and the lining of the uterus thickens, or proliferates. Ovulation is triggered by a surge in luteinizing hormone. The sudden change in hormones at the time of ovulation sometimes causes minor changes in the endometrium and light midcycle blood flow. After ovulation, under the influence of progesterone, the endometrium changes to a secretory lining in preparation for the potential implantation of an embryo to establish a pregnancy. If a blastocyst implants, then the lining remains as the decidua. This becomes part of the placenta and provides support and protection for the embryo during gestation. If implantation does not occur within approximately two weeks, the progesterone-producing corpus luteum in the ovary will recede, causing sharp drops in levels of both progesterone and estrogen. This hormone decrease causes the uterus to shed its lining and the egg in menstruation. The cessation of menstrual cycles at the end of a woman’s reproductive period is termed menopause. The average age of menopause in women is 52 years, but it can occur anytime between 45 and 55. 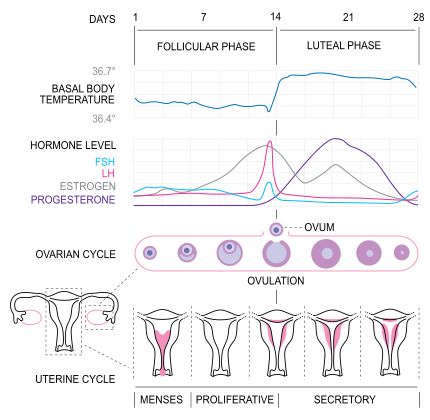 The Uterine Cycle: High estrogen and progesterone levels stimulate increased endometrial thickness, but following their decline from a lack of implantation, the endometrium is shed and menstruation occurs. Normal menstrual flow can occur although ovulation does not occur. This is referred to as an anovulatory cycle. Follicular development may start but not be completed although estrogen will still stimulate the uterine lining. Anovulatory flow that results from a very thick endometrium caused by prolonged, continued high estrogen levels is called estrogen breakthrough bleeding.However, if it is triggered by a sudden drop in estrogen levels, it is called withdrawal bleeding. Anovulatory cycles commonly occur before menopause and in women with polycystic ovary syndrome.